Collecting has been a pastime enjoyed by many people for generations. The collectables run the gamut from toys to ceramics to art. Of special interest to us are the toy soldiers and model ships and airplanes that are available in the marketplace today– some as antiques, and others as finely detailed scale models of the real thing. But what possesses one to collect and why venture into it? The answer to both questions is found by examining some of the great collectors of the 20th century. Three come to mind that particularly found an interest in toy soldiers. They are the great statesman Winston Churchill, the renowned publisher Malcolm Forbes and Britain’s 6th Marques Lord Cholmondeley. The one unifying theme in researching their motivation is a love of history and an interest in the military. Winston Churchill’s collecting began as early as age 7, noted in a letter he wrote to his father talking about his toy soldiers, flags and castles. His love of the military led him to Sandhurst and a career in the military long before he became prime minister. Many of the regiments he served in are now available in toy soldier collections. He was particularly interested in the Napoleonic era reflected in the collection he amassed of over 1500 soldiers on display in the home of his birth, Blenheim Palace. Both a student of history and a writer of it, Winston Churchill saw his toy soldiers as the next best thing to being there. Another avid British collector was the 6th Marques, Lord Cholmondeley. He also started collecting and reliving battles as a child. Fascinated also with the Napoleonic era, he had a great knowledge of various historic battles, parade formations and regimental uniforms. After serving in the Royal Dragoons in World War II he returned to his country home of Houghton House and embarked on expanding his collection which is now on display in a museum there. Few can top the passion with which Malcolm Forbes collected. His interest included Faberge Eggs, hot air balloons, model ships and yes, toy soldiers. His collections reflected his interests and life experiences. He loved his model boats and ships because they reminded him of his love of sailing as evidenced by his own Highlander yachts. When he collected toy soldiers, they took him back to his favourite battles in history and he heard the cannons roar, the drums pound and the bagpipes play. A visit to his Chateau de Balleroy in France re-enforces his fondness for history in evidence in the art and artifacts on the walls and in the rooms, many from the Napoleonic era and formerly owned by Napoleon and Wellington. Being the collector that he was, Malcolm Forbes not only enjoyed possessing his collectables, he also enjoyed the excitement of finding them to add to his collection. And being in the business of giving out investment advice, Mr. Forbes also amassed a valuable collection. While the Forbes Gallery in New York still has many of these on display there, Mr. Forbes Tangier Collection was sold by Christie’s for around $700,000 in 1997. And just as these collectors had special interests in the military and history often starting in childhood, so do the toy soldier collectors of today. Many have a particular favorite battle or regiment and begin their journey there. If you are ready to begin your collection, it can be an exciting and affordable hobby. You may want to start with the purchase of a reference book to help guide you through this adventure. There are also societies and fairs on both sides of the Atlantic to fan your passion and share your enthusiasm. 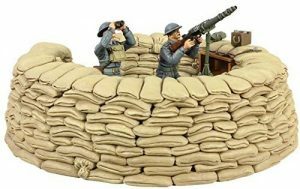 There are various types of toy soldiers manufactured over the past 100 years. Few antiques exist before 1890, when British manufacturer William Britain began mass producing them with new manufacturing techniques. These early Britain’s are hard to find but Christie’s sold the Paris Office artillery gun team in 2001 in excess of $4000. Pre- World War I sets are especially valuable since they were made in limited supply. While these are heady figures to dream about, you need not pay these prices for toy soldiers made today. There are a variety of models from tin to lead. And the prices vary from under $20 per soldier to the hundreds of dollars if you are into the antiques. Most collectors decide on a battle, a regiment, or era and begin with their first soldier and continue to build from there. You can amass quite a nice collection for $400-$500. And some of the manufacturers such as King and Country have refined the detail on the figures down to facial expressions. This truly makes the collection come alive. Should you decide to embark on the antique models be careful in how you display them and take care of them. The old Britain models are usually displayed in the box, since the soldiers were sold strung in the boxes and to unstring them would devalue the set. It is also a nice habit to display soldiers in procession or formation in a glass case, however, the case needs to be ventilated for these older models to prevent lead rot. If you are looking at the new models you may want to pick an event or moment in time, like the Trooping of the Colour, the Military Tattoo in Scotland, or the D-Day Landing and let the fun begin! !